Great value for money, lovely clean and quiet. Excellent place! Would definitely go back. This hostel is a gem! To say that its position is great is reductive, my window was right in front of one the best places in town! The dorm was very big and spacious and with all the facilities needed. It is an historic building so it's not modern inside too but that's why it's that beautiful, great atmosphere! The breakfast is good and most of all the staff boys are the kindest! Clean and a very kind staff! 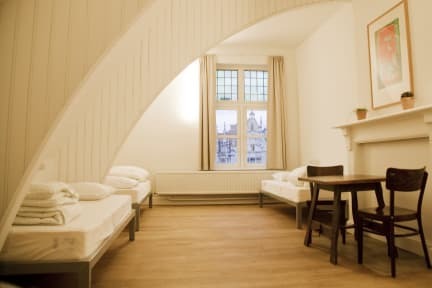 Super centrally located, free walking tours leave from the hostel, only thing is in the three room private the room was TINY and beds were stacked so I slept 15 feet in the air which was not the best. Bathrooms are nice, plenty of shower rooms. Nice cafe/lounge. Right next to the city centre. The view from the window of the rooms is gorgeous. The Hostel was located really really close to the city center! The offered city tour from the hostel was really informative and well done. The breakfast had a good variety and the staff was very nice. 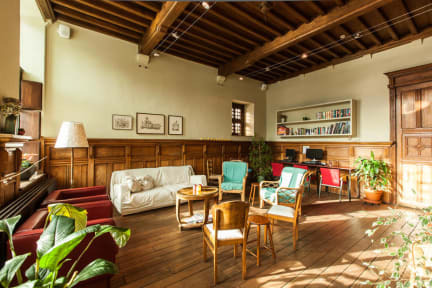 Great hostel with the most awesome location right in the heart of Ghent. It‘s a stunning building and we instantly fell in love with it. Rooms were nice and clean and the staff friendly. Because it’s an old house there is only one shared shower room, but there are cabins so it’s fine. Only critique: The bathroom smells like mold. All in all a great place to stay for a short trip to Ghent! The location is good, the staff is ok. They made a mistake thinking I was checking out so they move all my stuff in my room. Also the kitchen closes at 22h wich is early in my opinion and the commun area at 1am. Very clean, big rooms, bed comfy enough location amazing ! I would go back.